The Jazz are off for the next nine days; what will they be doing during the break? 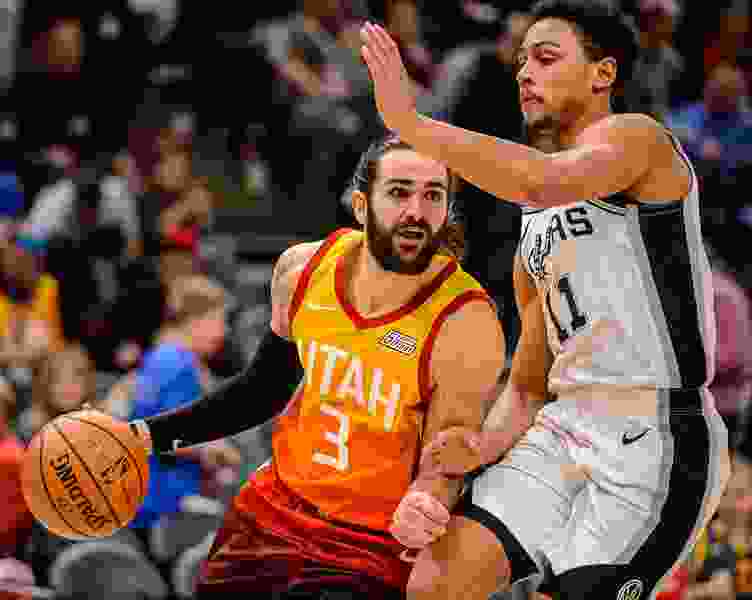 (Trent Nelson | The Salt Lake Tribune) Utah Jazz guard Ricky Rubio (3) drives on San Antonio Spurs guard Bryn Forbes (11) as the Utah Jazz host the San Antonio Spurs, NBA basketball in Salt Lake City on Saturday Feb. 9, 2019. Remember when the All-Star break was just five days? Before the NBA extended the break in 2015, often teams would play on the Wednesday before the break, then come right back and play the Tuesday after the Sunday game. In other words, the All-Stars would travel Thursday, participate in the NBA’s Day of Caring on Friday, perhaps play in a Skills Challenge or 3-point contest Saturday, and then the actual All-Star game Sunday, before coming back to their home cities on Monday to practice to play Tuesday. “Break” may not have been the right word. Now, though, the Jazz have fully nine days off, and thanks to Rudy Gobert’s All-Star snub, they have no one participating in the Sunday game. Donovan Mitchell will play in Friday’s Rising Stars contest, as well as commentate Saturday’s Slam Dunk Contest on TNT. Everyone else, though, plans to do their own thing, taking a chance to rest and relax around the world. Some players are going on vacation to somewhere warm: Ricky Rubio is headed to Cabo San Lucas in Baja California. Grayson Allen is headed to the Bahamas for a few days, then will head to Durham, North Carolina to watch a Duke basketball game on Saturday. Some just want to hang out with family. Georges Niang will support his friend Mitchell in Charlotte, then he’ll head back to the northeast, back to his home region of New England. Tony Bradley is headed to Florida for the same reasons. Ekpe Udoh said he has to go back home to Oklahoma “and handle some business,” and critically, update the his book club’s site with Michelle Obama’s stamp of approval. Jae Crowder said he wants to spend time with his family somewhere warm, but hadn’t planned out his destination by the eve of the break. For NBA players, booking last-minute travel isn’t always a concern. Thabo Sefolosha knew where he was going, but didn’t want to reveal his destination to the media. Kyle Korver is taking his family to Santa Barbara, flying straight from the game Tuesday in Oakland down to Southern California. That’s where he’s traditionally made his offseason home. Many players mentioned the importance of staying in shape during the elongated break. Korver will work out a P3, the famed sports performance training facility. Niang will find ways to work out, no matter where he is. It is certainly a break on the body, but the other side of recovery is important as well. “It’s more of a good time to mentally recharge your brain and get ready for the push you want to make for the last half of the season,” Niang said.